1. split or sever (something), especially along a natural line or grain. adhere strongly to (a particular pursuit or belief). I opened my eyes to the sight of two nearly identical faces peering into mine. I stretched my arms out for a hug and, instead, found two handmade cards thrust in my face. I lingered over them, the stick figures depicting our family. Two heads with blonde hair, three with black. The lettering alternating between block and cursive, the misspellings achingly adorable. We hugged for a long time before my youngest, the one born to me, toddled in. All through the morning, my timeline on social media was flooded with Mother’s Day wishes. “Be sensitive to those without mothers, those longing to be mothers, and those who lost children” exhorted one friend on Facebook. I debated between a like or a cry reaction, and settled on a simple like. My mind harkens back to the days when family tiptoed around me. Dinner with friends would start with a toast to moms and I would withdraw into a shell. In my thirties and desperate to be a mother, I was thick in the middle of infertility treatments, each menstrual cycle a roller coaster ending with a thud that left me bruised and battered. Pulling on a blouse one day, my eyes fell on the purple and blue streaks on my abdomen from the hormone shots and it hit me that I could do it no longer. I gave up on medicine and focused my research on adoption instead. Domestic? International? Foster? The questions were many and my husband and I were limited by our status as permanent residents. We settled on domestic private adoption with an attorney facilitating the process. When motherhood finally found me at the age of 35 and I went from being childless to the mom of twin toddlers in a week, I embraced it. My shiny new iPhone captured my children’s first days home in all their glory. I clicked as they napped, ate, drooled, and crawled. I mastered the art of the selfie so I could be in pictures with them. “My children!” I captioned, lingering on the exclamation as if it would convey the miracle that motherhood was for me. A few months into legally being anointed Mother, my first Mother’s Day rolled around—and I was perplexed to find that I felt like a fraud. I grieved on what should have been a day of celebration. I felt walled in, able to see, unable to participate. I remembered my twins’ first mother, their other mother, and ached for her. The last image I had of her was of the night we’d had dinner as a family, a day after we officially became parents of her children. The conversation was slow, stilted. We focused on the children, hoping that would keep the deep sorrow that permeated the air from swallowing us whole. We left not knowing when or if we would meet next. I emailed her a few weeks later, sending her a link to a blog filled with pictures and minute details, like how many hours they slept, what they weighed, how much they ate. Things I figured a mother would like to know. I had no idea if she read it or not. On that first Mother’s Day, I agonized over sending a wish her way. She was a mother and would be one all her life. My children were living proof of that. Was it a day of celebration or mourning? I hesitated as I typed out “Happy Mother’s Day!” Was I being insensitive? But if I did not mark the occasion, would that mean I was usurping the title of ‘Mom’ from her? I dithered and sent out the email. I heard from her days later, simply thanking me and hoping my day was good. I strained to read the scant text, parsing word usage for hidden meanings. I learned to fake it until, one day, I made it. 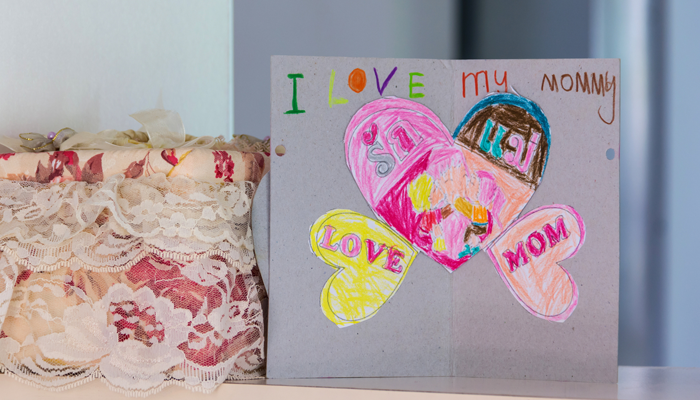 I remember the cards, the flowers, the chocolate, and, most of all, the chubby hands and arms entangled with mine one Mother’s Day morning and I knew I belonged. I had left my infertile world behind. I claimed my seat at the table even as I acknowledged that what was a day of joy for me was a day when the other mother of my children mourned. Our relationship warmed but I did not dare to ask her, really ask her, how she was doing. Did the pictures I send reassure her? Did they remind her of all that she was missing? Was I sharing or was I gloating? There was no rulebook. Motherhood for me is fraught with questions. I compartmentalize, I strive to be the mother I should be to my children. I feed them by hand, the texture of the pongal just right, the temperature warm enough. I am generous with the ghee, as my mother instructs me over the phone. I smother them with physical love, the sesame scent of the oil I massage into their skin reminiscent of my childhood. I worry I am not doing enough—to show them that this life I lead is one I desperately craved…to heal the fissures that came from being separated from their mother. They were without agency in this decision that changed their lives, but I am dedicating what agency I have to making sure they remain whole. Late in the night, I message their mother. I read her blog searching for signs. I realize happiness may be too much to ask, so I settle for peace. The kind of peace that comes from knowing that, despite her decision to place her children, they are not lost to her. They belong to her as much as they belong to me. “Aren’t you afraid your children will leave you when they are old enough? What will you do if they move back to their birth family?” I’m asked these questions when I speak about our adoption to people we meet socially. I fall silent trying to understand what the word “leave” means in this context. Can I make them understand that there is no real leaving, that she is family as much as my children are? I usually deflect, changing the topic or answering in monosyllables. To very few friends, I explain that I am not insecure, that I view my children (all of my children) as being fellow travelers on my journey in this life. They will all leave eventually, I tell them. Sometimes, I wonder if I’m really so secure in my capacity to love them or am I guarding my own heart, steeling for the eventual separation? I turn to my youngest, a child born from me, for answers. My love for her takes a different timbre; it is subdued, it is mind speak, it is soul-binding. I quit work after she was born spending an enormous number of hours just physically cuddling her. I know her smell, the chocolate brown of her skin, the thick, frizzy strands of her hair, the liquid brown pools of her irises. I know her the way I know myself. There is much discussion of language in the adoption community. Some claim qualifying a child with “adopted” is unnecessary. I find myself nodding as I think that all three children are mine in a way they will never be another person’s. But then adult adoptees claim that the word defines their experience, and that removing it erases their history. I find myself nodding and relating to my cleaved motherhood. In the days following the adoption, I struggled with the fact that, to receive my children’s amended birth certificates, I would have to send in the originals with her name as their mother. I made copies before mailing them in and received new ones listing my husband and me as parents as if they had been born to us. Birth parents relinquish their rights in perpetuity, as if ensuring that the child is a blank slate upon which a new life is written. On the other hand, adoptees grow up with a burning need to figure out their identity, all parts of their heritage. They are torn between owing allegiance to the people who raise them and to the people who brought them into the world, never really being told that it is OK to embrace both families. I want my older children to know the uncomplicated love that my youngest knows and understands, but I also feel that it may be impossible when they are being pulled in different directions. In my conversation with other adoptive parents, the idea that parents can love many children, therefore, children can love two sets of parents, is brought up. In principle, I agree, but my heart says it is not the same. There is something inimitable about being cocooned inside another person’s body that marks you and them for life. That bond can be supplemented, approximated even, but never replaced. My children are young, still in the process of growing their vocabulary when it comes to expressing adoption grief. I see it in the way the air stills when we talk about their birth family. I see it in the way they claim cards and gifts from their great-grandparents. I see it in the wistfulness when they send messages to their mom. I see it in the way they eye me with my youngest. “You don’t know me from your heart,” my oldest child hurled at me one day as we argued about chores. I stopped, struck by her choice of words. I went mute because it hit too close to home and needed time to figure out how to answer. Later that night, I sat on her bed, my ears on her chest, listening to her heart. I promised to listen to her heart and invited her to listen to mine. We talked about what was frustrating her and annoying me. The issue was resolved, but I walked away with something greater, an understanding that sometimes it takes a little extra listening to understand what my twins say. As inviting as it is to redefine family as based on love, to focus on our shared history and experiences, the loss of children to adoption impacts generations. My heart aches for the lost ties, the members of their birth family who are unaware of my children’s existence. It brings me back to Mother’s Day and all of its associated connotations. It makes me question what makes a mother. It makes me focus inward and accept the dichotomy so I can move forward. By accepting that there is a difference in the way I connect with my child by birth and my children by adoption, I can attempt to understand how their birth mother feels. I can try to understand how my children view adoption and the pull they have toward their birth families. It helps me celebrate mothering as an ongoing action rather than a one-time incident of giving birth. And it helps me accept that my motherhood is cleaved and that that is OK.
Look for this piece and many other first-person pieces by strong women in the forthcoming anthology, I Am Strength: True Stories of Everyday Superwomen. LAKSHMI IYER has a certificate in creative writing from The Writer’s Studio at Simon Fraser University and blogs for The Huffington Post. She can be found online on Twitter @lakshgiri and on Facebook. A mother by adoption and biology, she resides with her husband and children in the Northeast U.S. On most days, she can be found by the stove serving up hot food. When she is not cooking, she recounts the mundane-ness of her life in startling detail on her blog.